We get 60% of our energy from the air we breathe! LightningAir is designed for applications in homes and offices up to 3500 square feet. The LightningAir blends into your home decor. The LA-2SPX is for normal indoor spaces such as homes and offices. The LA-4 is for bars, restaurants and heavily used areas. 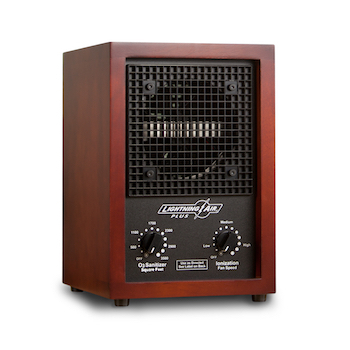 The LightningAir Purifier - The LightningAir is not a filter. Instead it re-creates the same process that Nature uses to keep the air fresh and clean. It generates the negative ions that nature uses to clear the air of dust and other particles. Plus it has a built-in O3 Sanitizer to remove odors without the use of fragrances. O3 breaks down mold, mildew and other pollutants at their source. Odors from Pets, Cooking, Tobacco, Etc. Control the Cleaning - The Ionic Purifier comes on automatically as you turn the unit on. Negative ions can be created around the clock to keep down dust and particulate. The O3 Sanitizer has a separate control and is most effective in unoccupied spaces. Activated oxygen is kept at modest levels in occupied spaces. To remove major odors as well as mold & mildew, simply close off the area and let the Sanitizer do the work. Some use a timer to completely deodorize the home or office while away. Unused O3 reverts back to O2 in about an hour. So Easy to Use - The LA-2SPX has a convenient handle on the back and is totally portable. Just plug in and start to enjoy clean, mountain-fresh air for only pennies a day! Durable ceramic plates are removed through slots in the back of the unit like a CD and can be washed with a cleaner for easy maintenance. Most indoor particles are positively charged. The ionic purifier creates negative Ions that cause dust and other particles to fall out of the air. Waterfalls and waves at the beach are good examples in Nature. Nature gives some particles a negative charge. Particles clump together then fall out of the air. The sanitizer creates 03 that breaks down odors and other pollutants at their source without the use of fragrances. Ozone, 03 is created in Nature by lightning and gives off a clean, fresh smell after a thunderstorm. O3 or ozone is basically supercharged oxygen. Regular oxygen is O2 and ozone is simply O3. Nature regularly transforms oxygen into ozone through forces such as lightning and ultra-violet light striking the earth. O3 then acts as a natural sanitizer. After a short period of time the ozone reverts back to regular oxygen at ground level. How We Learn About It - We learn about ozone in two different ways. The first is the protective ozone layer in the upper atmosphere that helps to reduce the amount of ultra-violet light that strikes the earth. This layer of O3 is gradually being depleted as a result of specific pollutants such as aerosols and the older refrigerant gases. Steps have been taken to reduce these pollutants, but there is an ongoing concern about protecting the ozone layer. The second way we learn about O3 is the ground level ozone in polluted cities. Automobiles and industry put out excessive levels of hydrocarbons into the air through exhaust emissions. When ultra-violet (UV) light from the sun strikes hydrocarbons, ozone is created. For millions of years, nature has created ozone by sunlight striking hydrocarbons, emitted from decaying matter, as one way it keeps the earth clean. This is nature’s response to pollution in the air. When the exhaust emissions are high, the O3 levels become high as a response to the hydrocarbons. The level of ozone in some cities may exceed 200 parts per billion (ppb) on days when pollution is high. On the other hand, without O3 and UV light the earth would be an odorous place with mold, mildew and viruses running rampant. The forces of nature are designed to keep the outdoors clean and balanced. Unfortunately, there is normally very little ozone in our indoor spaces where we spend nearly all of our time. This is because the buildings where we live and work are designed to shut nature out. How It Is Used - Ozone is created by man for purification purposes. It is injected in nearly all bottled waters and is widely used in Europe for treating municipal water supplies. O3 is also used for indoor air treatment but it must be employed in a manner that is both safe and effective. The typical way O3 is used commercially for air treatment is by blasting a high level of ozone into an unoccupied space. For example, if a hotel wants to change a smoking room to a non-smoking room, they use an ozonator such as the LightninAir Industrial Cleaner to pull odors out of the carpet, drapes, bedding, etc. Smoke damage restoration services also use O3 to remove odors. The FDA has approved O3 for treatment of air and water in food processing plants. Water damage restoration companies treat air with O3 at high levels in unoccupied spaces to get rid of smells as well as mold and mildew. Some restaurants, bars and casinos are now beginning to use ozone at relatively low levels to keep the air smelling fresh and clean at all times. High Level Use - The O3 Sanitizer may be used to treat unoccupied spaces, including the entire home or office. This is the most effective way to attack microorganisms and reduce strong odors because it allows the O3 to go after pollutants at the source. Ozone has been proven to reduce levels of mold, mildew and other microorganisms. It will also help accelerate the dissipation of chemicals from new carpet, furniture and paint. Simply close off the problem area or shut the windows and doors in the entire home. Next, set the O3 dial to correspond to the size of the area to be treated. Then leave the space for 1 to 4 hours depending on the severity of odors. Upon return, open the doors and windows to let in fresh air until the O3 smell is gone. Perform this procedure as often as necessary until the odors are removed. Timer - Many users prefer a plug-in timer, like is used on lamps, so that it comes on everyday for a few hours while they are at work and then shuts off a couple of hours before they return home. When they walk in the air smells fresh and clean and the O3 has reverted back to normal O2. Occupied Spaces - Some users keep the O3 Sanitizer at a relatively low setting while in the home or office. This can hold down microorganism growth while keeping the air smelling fresh and clean. However, caution is advised because O3 levels may exceed those recommended by government agencies. Each home is different so it requires a trial and error process to locate the right setting on the dial. If you choose to use the O3 Sanitizer in occupied spaces, set the ozonator dial at a modest level initially and let it run for a couple of hours. If you smell ozone when you walk into the room, turn the dial down or off. On the other hand, if you smell household odors, turn the dial slightly up. Repeat the process until you walk into the room and do not smell household odors or ozone—just clean fresh air. Caution is the key to use of the O3 Sanitizer in occupied spaces. Caution - Excessive ozone concentrations can cause mucus membrane or respiratory irritation. Individuals with serious respiratory problems such as emphysema should consult their physician before use. Those with a poor sense of smell should also exercise caution. If O3 is detected when entering a room turn the O3 Sanitizer dial down or off. If a dry throat, cough or watery eyes is experienced ventilate the area and discontinue use. The level of O3 generated at a particular setting on the dial will vary with humidity, altitude, household contents, level of pollutants in the space and other factors. The average person is able to smell ozone as the room level approaches 20 ppb indoors. The FDA sets an upper level of 50 ppb in continuously occupied spaces for sensitive persons such as the very young, the elderly and the sick. The EPA has set a target level of 80 ppb for outside air in cities, but that is regularly exceeded. A rule of thumb is to turn the Sanitizer dial off or down if the O3 smell is detected. Modern buildings are constructed so tightly that odors and pollutants are trapped inside. Nature's own cleansing process, which uses both activated oxygen and negative ions are left outside. Dust, pollen, molds, mildew, bacteria and viruses can fill the air in our living spaces. These can cause odors, irritation and allergic response. Fumes from paints, cleansers, carpets, pressed board, fabrics and other chemicals are also breathed in daily by you and your family. According to the EPA, many pollutants in the typical home or office are at least 10 times higher than in outdoor air. The average American spends 90% of their time indoors. Have you ever walked into someone's home and noticed an odor that you are not accustomed to? Odors are constantly created in the spaces where we live. Finding a simple solution to clean air is not always easy. As air passes through a filter, small particles that are floating in the air are trapped. This is helpful in reducing particles such as dust, pollen and dander, but is only part of the solution. Most gases and odors pass right through even the best Hepa filters. Dimensions (H x W x D): 12"H x 8"W x 10"D, Weight 16 lbs. For the lifetime of the original purchase LightningAir will replace any defective part due to manufacturing defect at no charge. The customer is responsible for labor charges and for safely shipping the unit to the Service Center. LightningAir will return the unit via UPS ground. LightningAir purifiers are serviced and warranted by the LightningAir Service Center. For up to 90 days from original date of purchase, LightningAir will replace or repair the product without charge to the customer should the unit prove to have a manufacturing defect. Simply call LightningAir for authorization and for UPS pickup at no charge to the customer.